For those who are not aware of what ALS is all about, here is the primer. According to ALS association, ALS which is referred as Amyotrophic Lateral Sclerosis is a progressive neuro degenerative disease that affects nerve cells in the brain and the spinal cord. 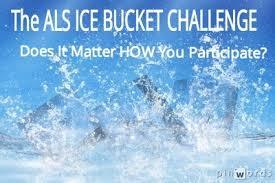 The incidence of ALS is 2 per 100000 people and approximately 5600 people in the USA are diagnosed with ALS every year. 1. To what extent this campaign is relevant in our country when the no of reported cases of ALS in India is not yet well known? 2. Assuming that at least few get affected by this disease in India, should we donate funds for research in this space (ALS) as a matter of priority when this disease does not even figure in the top ten killer diseases as far as India is concerned? I truly appreciate the intention and effort of many to support this cause except questioning their priorities. 3. What will be the implications of ALS research to India? According to IDF (International Diabetes Federation), India accounts for the largest no of people suffering from Diabetes in the world (50.8 million) followed by China and the USA. If this data does not convince you, here is the another one. Heart disease is emerged as the no one killer disease in India followed by respiratory disease and TB. I really awe the ice bucket challenge campaign and support the cause to raise awareness and donation but i am perplexed to see why we fail to see and do what is relevant to our country in the area of healthcare. Hopefully we can learn some lessons from ALS campaign. CEO of BrandValueZ, a brand consulting firm & Course facilitator at PSG Institute of Management. My Role: Inspire young minds & help clients solve Key Branding and Digital Marketing challenges, USP: Unique Blend of Creativity and Logic; Purpose Led, People Centric and Process Driven Approach to solving branding and Digital Marketing Challenges.